Fun Express Patriotic Bean Bag Toss Game by Fun Express at Saltarines Quito. MPN: 35/81. Hurry! Limited time offer. Offer valid only while supplies last. Patriotic Party Games Show Off Old Glory With New Style! Spice up the Patriotic party with unique Patriotic games like this Uncle Sam Bean Bag Toss! Patriotic Party Games Show Off Old Glory With New Style! 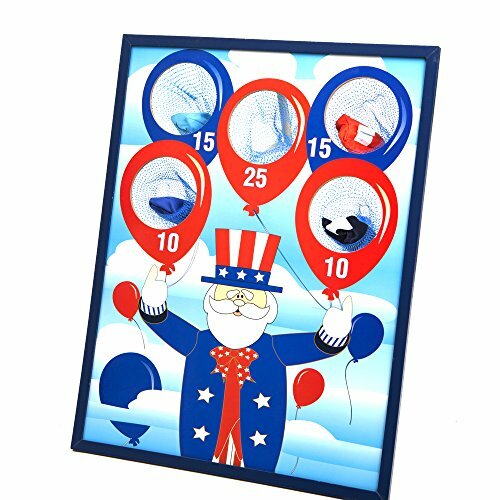 Spice up the Patriotic party with unique Patriotic games like this Uncle Sam Bean Bag Toss! 1 game per package. 22 3/4" tall and 17 3/4" wide. Made of solid and sturdy wood. Includes the board, five 2 1/2" bean bags, and a 23" long wooden pole to support the board and keep it upright. Easy to play: Each player throws the bean bags at the Uncle Sam board. The player who scores the most points (by landing their bags in the holes with the most point values) wins a prize!